Two cosmonauts ventured outside the International Space Station Wednesday, jettisoning three no-longer-needed components and carrying out a photo survey of the Russian segment of the lab complex in the seventh and final spacewalk planned by the station crew this year. They completed it all much faster than expected. Expedition 41 commander Maxim Suraev and flight engineer Alexander Samokutyaev opened the hatch of the Pirs airlock compartment at 9:28 a.m. EDT (GMT-4) to officially begin the excursion, making their way to the top of the Zvezda command module to detach the Radiometriya experiment package. The no-longer-operational experiment, designed to monitor seismic activity, was released from a work platform and carefully pushed away into space by Suraev. The 207-pound component could be seen slowly departing in the wake of the station, disappearing from view a few moments later. The cosmonauts then removed a cover from a materials science space exposure experiment package, stowed it in the Pirs airlock and made their way to the Poisk module atop Zvezda where the Soyuz TMA-14M ferry craft is docked. When the Poisk module was launched to the station in 2009, it carried out an autonomous rendezvous and docking using a Russian navigation system that included a pair of dish-shaped KURS antennas on the forward end of the compartment. Those antennas have not been needed since then and the cosmonauts removed them Wednesday, cutting through cables and unbolting the fasteners holding them to the hull. Samokutyaev, assisted by Suraev, then jettisoned the antennas one at a time, releasing them to the right rear of the station's long axis. NASA trajectory analysts said none of the components would pose any threat to the station between now and when they eventually fall back into the atmosphere. Throughout the spacewalk, the cosmonauts used still and GoPro video cameras to document the condition of various components on the Russian segment of the space station. They also collected particulate samples from a window in the Pirs compartment as part of an ongoing study to learn more about how rocket plumes affect various surfaces. Reid Wiseman, inside the station, did his own photo documentation, snapping pictures of the spacewalkers. "Reid is taking pictures of us furiously," one of the cosmonauts said. "That's why I'm hearing all this incessant clicking," the other joked. The spacewalk was timelined for six hours, but the cosmonauts completed all of their planned tasks in a bit more than half that time. Suraev and Samokutyaev returned to the Pirs airlock and shut the hatch at 1:06 p.m. to officially close out a three-hour 38-minute EVA. This was the 184th spacewalk devoted to station assembly and maintenance since construction began in 1998, the seventh and final planned EVA of 2014 and the second spacewalk for both Suraev and Samokutyaev. With the conclusion of EVA-40, 119 astronauts and cosmonauts representing nine nations have logged 1,152 hours and 27 minutes of spacewalk time outside the orbital laboratory, or 48 days. 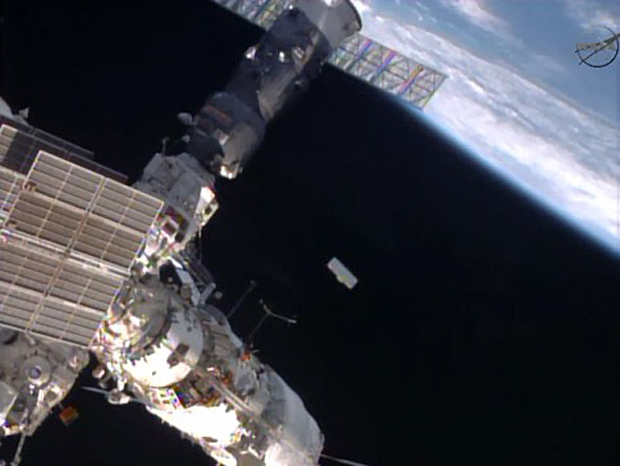 With Russian EVA-40 complete, the station crew faces a particularly busy few weeks. A SpaceX Dragon cargo ship will be unberthed and released from the forward Harmony module's Earth-facing port on Saturday, setting up a splashdown in the Pacific Ocean west of Baja California. A Russian Progress cargo ship is scheduled to undock from the Pirs module on Monday, the same day Orbital Sciences Corp. plans to launch an Antares rocket carrying a station-bound Cygnus cargo ship loaded with equipment and supplies. Another Progress is scheduled for launch two days later. The Progress M-25M/57P cargo craft will carry out an autonomous rendezvous with the station, docking at the Pirs module about six hours after launch. If all goes well, the Cygnus cargo ship will reach the station on Nov. 2. Suraev, Wiseman and European Space Agency astronaut Alexander Gerst are scheduled to return to Earth Nov. 10 (Nov. 9 U.S. time) aboard the Soyuz TMA-13M spacecraft that carried them into orbit May 28, closing out a 165-day stay in orbit. Samokutyaev, Elena Serova and Expedition 42 commander Barry "Butch" Wilmore will have the station to themselves until Nov. 24 (Nov. 23 U.S. time) when the Soyuz TMA-15M ferry craft delivers Anton Shkaplerov, Terry Virts and ESA astronaut Samantha Cristoforetti to the laboratory.